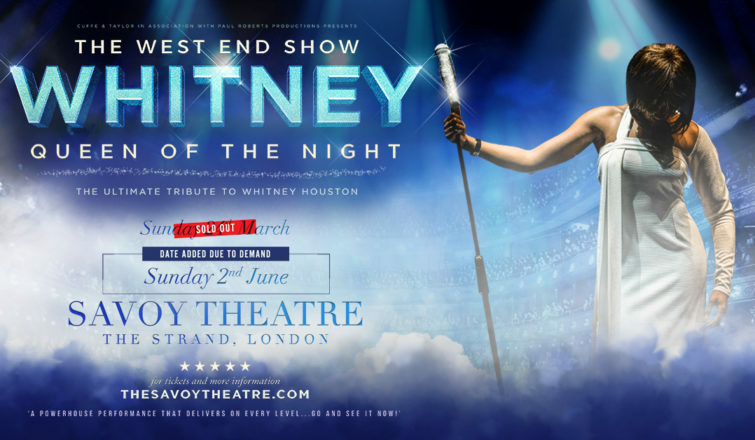 Critically acclaimed international stage sensation Whitney – Queen of the Night will return to London’s Savoy Theatre for a second show – after its premiere performance sold out. The production makes its West End debut in front of a full house at the Savoy on Sunday March 24. And due to the huge demand for the stunning celebration of the music and life of one of the greatest singers of our time, the show will return to The Savoy Theatre on Sunday, June 2. Speaking about the sell-out show and new date, Elesha said: “It is amazing to be planning and preparing for our West End debut knowing that there will be a sold out audience at the historic Savoy theatre. Whitney – Queen Of The Night is brought to you by Cuffe & Taylor in association with Paul Roberts Productions. This is a tribute production and is not affiliated or endorsed by the Whitney Houston Estate.